12. Hell Gate STM 602 The very name of this short ¾ mile stretch of the ICW strikes fear into the hearts of many cruisers. It needn’t. While at 3’7” it is the shallowest section of the ICW we have seen, with 7 to 8 feet of tidal range, it is very easy to plan your transit with plenty of water. Northbound we find that the anchorage at Duplin Creek is a nice place to stay, good shore access at a dinghy dock and miles of roads to hike. 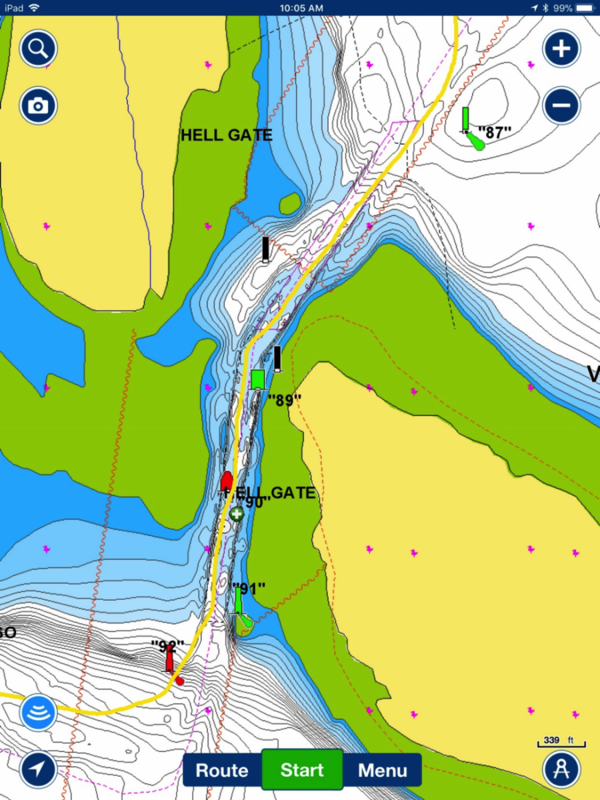 It is 40 nautical miles south of Hell gate and is a good staging point for a late day high tide. If you prefer a marina stay, at STM 620 you can head up the Medway River to Sunbury Crab Company, a very popular restaurant in a nice marina. Kilkenny Marina is a little more rustic. You’ll find it 1.5 miles off the ICW at STM 612. From any of these staging points you can time your Hell gate transit on a rising tide. After you clear hell gate it is only 10 miles to the marina at Isle of Hope. IOH I certainly one of the prettiest towns on the ICW. Another 5 miles brings you to Thunderbolt Marina. We transited March 24 with +5.8 feet of tide. Our track followed the best water we could see on the up to date Navionics sonar chart. Over the years we have learned not to turn at G89, but to continue to a point about 300 feet north before making the turn towards the northeast. On our track, we noted 9.8 feet between G91 and R90. Subtracting 5.8 feet, and you will see 3’7” at MLLW. Note: The name of this channel is Hell Gate. It is not Hells or Hell’s Gate. NOAA usually does not use possessives in their naming protocol.